Food, Science, Art: Is it done yet? How many of us have been either cooking at home or on a hot line in a restaurant and asked the question, is it done yet? I know that I have certainly done this in both aspects and I am certain that many other individuals have as well. Whether it's that steak on the grill or the Thanksgiving showpiece turkey we are all left wondering. Well what if their was a magical panacea that could provide an answer to this age old question? Well that's simple...it comes to us straight from our common core classes of math and science. The solution to the question, is it done yet? starts with an equation. 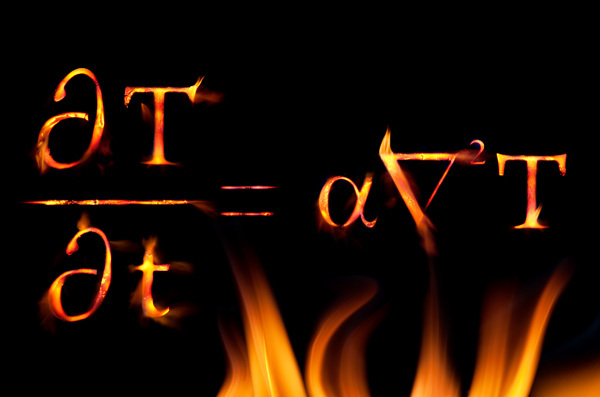 This equation is known simply as the heat equation. The equation was developed in the early 19th century by Jean Baptiste Joseph Fourier. It describes how heat travels through solids by conduction. So now you are probably saying, well how can this equation help answer the aforementioned question and what the hell does any of this equation mean? The first part of the equation that proceeds the equal sign represents the rate at which temperature is changing with time. 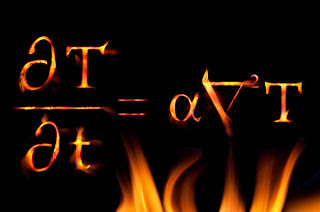 The second part of the equation that follows the equal sign (alpha) represents the thermal diffusivity of the food item. Thermal diffusivity is the measure of how fast heat spreads through a particular food item at a particular temperature. The third and last part of the equation represents the temperature gradient in the food. The equation tells us that the steeper the temperature gradient between the inside and the outside of the food, the faster heat will flow to its interior. Now that we got the science/math aspect down all you need to do is get the three components as listed above and plug the numbers into the equation. If you are a science/math specialist this may be simple to perform, but if you are like 99.9% of the world you can just search the internet for an accurate source that gives the figures for the food item you desire to cook. So the next time before you find yourself asking, is it done yet? do your homework and equate out the amount of time needed to cook your food item.